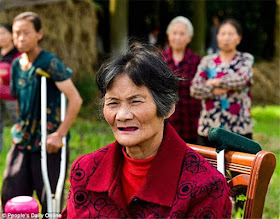 A 73-year-old mother in China is suing her four children for failing to take care of her. 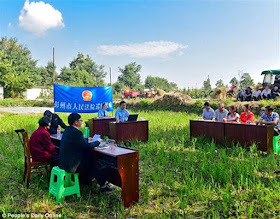 The hearing took place on farmland in rural Pengzhou, China's Sichuan province, on September 30. 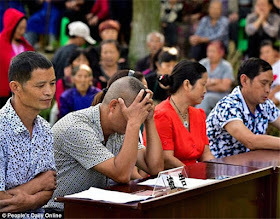 During the hearing, she demanded to live with her eldest son and his family and also demanded that each of her four children give her 100 yuan (£12) a month. The court decided to hold the meeting outside for 'the purpose of spreading legal knowledge'. Over 100 people turned out to watch the case. The woman claims that she has been living in a derelict temple since 2010 after her husband died. 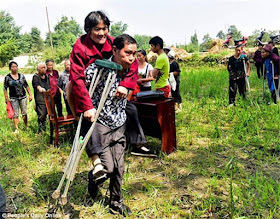 During the court trial, the woman demanded to live with her eldest son and his family. She also requested that they provide her with 30 kilograms of rice on top of lodgings. 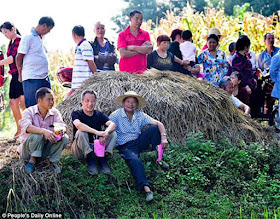 The mother also demanded that the eldest son farm her land.